Here’s a delightful short children’s book with the Norse Myth heroes, Odin and Thor, as main characters. It’s wonderful to see contemporary authors make good use of imagination and the wealth of possibilities from the Norse stories. Since the stories are a big part of the Waldorf third grade curriculum, a children’s book like this becomes very appealing as a follow up. 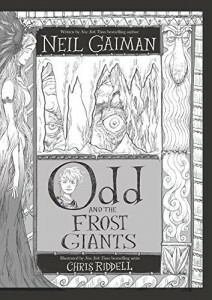 Neil Gaiman is, of course, a very talented writer, with his very own quirky sense of humor. So this children’s book is fun, light-hearted, and extremely well-written. That’s a very hard combination to beat. I do think it’s helpful if the young reader has read or is familiar with Odin, Thor, and Loki, as the fun revolves around knowing who they should be, and who they have become because of an enchantment. But my guess is that the book could stand on its own if this is the first introduction to the Norse characters. The story that Gaiman tells is all his own, while the story in another contemporary take off, Thor’s Wedding Day, is more based on the commonly known myth. This children’s book is a very quick read, and at an easy enough reading level that any third-grade student can enjoy it on their own from start to finish. Highly recommend this one for a school or classroom library. Great one for young boys.